Planting wildlife food plots is a common practice for landowners in the Great Lakes region and elswhere in the country. Many landowners and land managers believe that a properly managed habitat and deer herd includes planted food plots. While the contribution of supplemental plantings to deer management should not be overlooked, more benefit can be realized through manipulation of their native habitat. Practices such as well-timed timber harvesting techniques will provide abundant, high-quality forage and cover for deer at little or no cost to the landowner. LOCATION: Plots should be located on fertile soils with adequate drainage. Cover should be located nearby or scattered across the plot. Food plots should not be established near a public road or waterway due to the increased possibility of poaching and car/deer accidents. SIZE: Plot size and shape may vary with local conditions, but to provide adequate sunlight to meet forage production requirements generally should not be less than one acre. 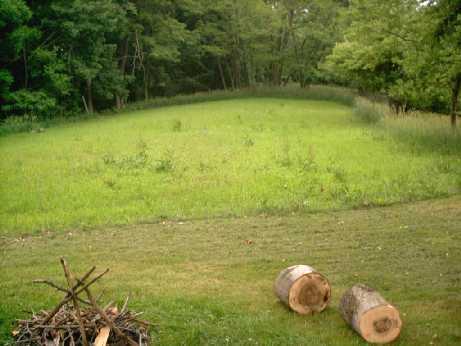 SPACING: Plots should be scattered over the entire property if possible. It is more beneficial to establish 10 plots, 2 acres in size than to have a single 20 acre field. Cost may dictate total acreage planted. SOIL TESTING: To ensure productive food plots conduct soil tests for fertilization and lime requirements. Your local county agent can provide information on soil sample collection and where to send them for analysis. Be sure to list the potential crops to be grown when sending in soil samples for testing. PLANTING: Be sure to select a plant species or combination of species that will grow on the particular soil type and site that you have. If you are unsure, ask your county agent, wildlife biologist, or local seed supplier. Proper seedbed preparation will increase germination and yield more productive food plots. Plant crops at the prescribed seeding rate and during the proper planting season. It is crucial that legume seeds (clovers, peas, beans) be inoculated with nitrogen fixing bacteria before planting. Arborists in Wisconsin say action must be taken to protect oak trees in the southeastern portion of the state from spreading oak wilt disease. © Franks Logging Inc. Copyright 2015 All Rights Reserved.